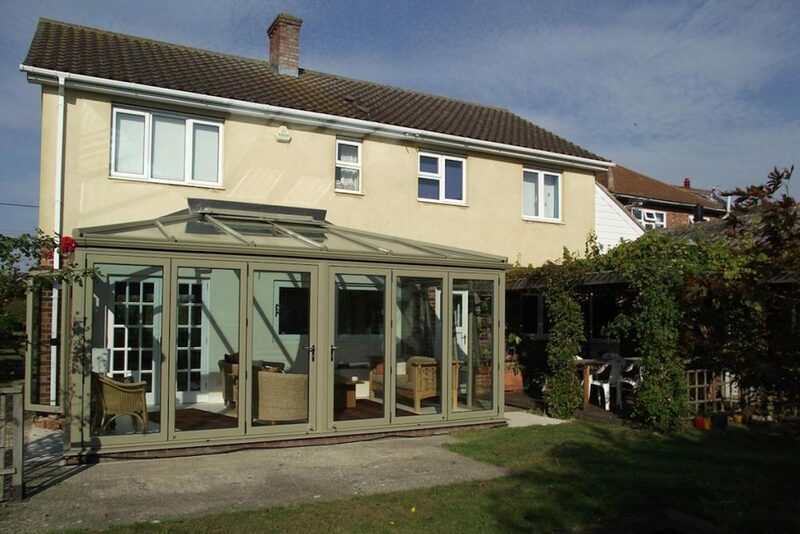 Ramping Up The Lifestyle With A Rampton Conservatory! When the owners of this house in Rampton wanted to add a year round outdoor living space, they naturally thought a conservatory would fit the bill. But they had seen far to many white uPVC conservatories and although they could see how a conservatory would work perfectly for them, they just didn’t feel that white would sit well against the traditional cream walls of their beautifully rendered home. Fortunately, the Cambridge Conservatory Centre had the perfect solution. Already offering a completely bespoke design and build service, we were at the forefront of the latest advancements to uPVC. When the owners selected a stunning olive green finish for their bi-folding doors that would provide the link to their garden, we were able to colour match the uPVC elements exactly. The green sits perfectly not only with their cream rendered walls but also works beautifully with the brick elements too. Subtle yet making a statement all it’s own, this Rampton Conservatory provides all the practicality and beauty the owners were hoping for. Sitting snugly alongside a rose covered pergola, the conservatory compliments the natural elements wonderfully. Double doors open directly from the living areas of the main house into the conservatory. And there’s an added feature too. The window above the kitchen worktop slides back creating a seamless servery between the two rooms. Practical yet simple solutions to ensure that the conservatory not only works beautifully as a separate space but also links to the main house. 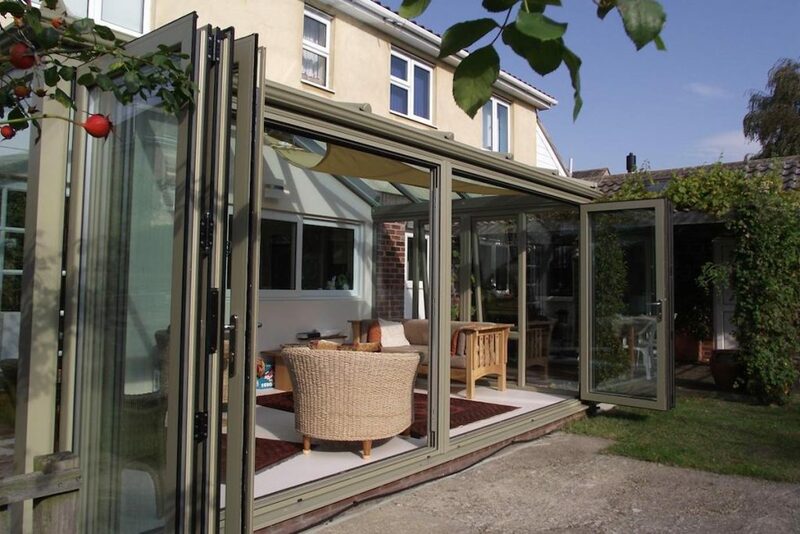 A wide set of six folding panel doors allow the front wall of the conservatory to be completely opened up to provide the feel of sitting in the garden. With a light coloured tile floor that matches the cream render on the exterior of the main house, the two spaces sits harmoniously together. And on days when a little shade from the summer sun is wanted, a simple canvas sail can be opened under the fully glass roof. 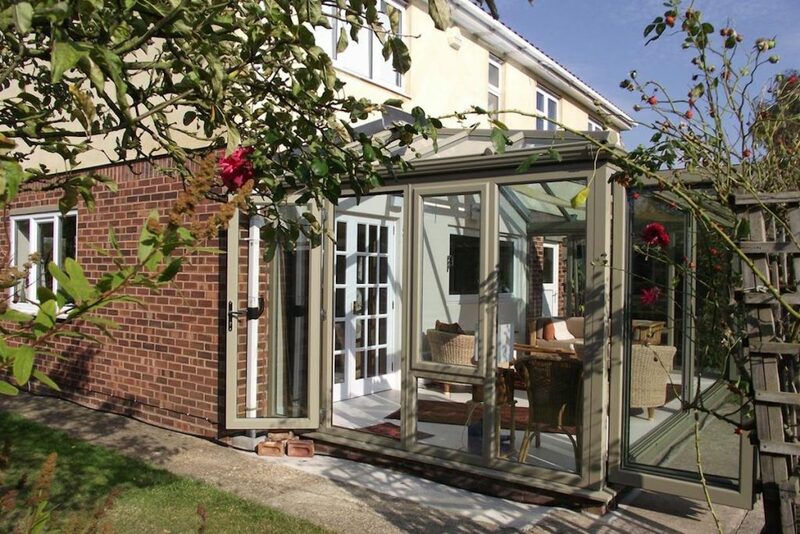 Whether opened up to enjoy the garden or closed to enjoy the warmth of the winter sun, the Rampton Conservatory really ramps things up and makes a stunning addition to an already beautiful home.